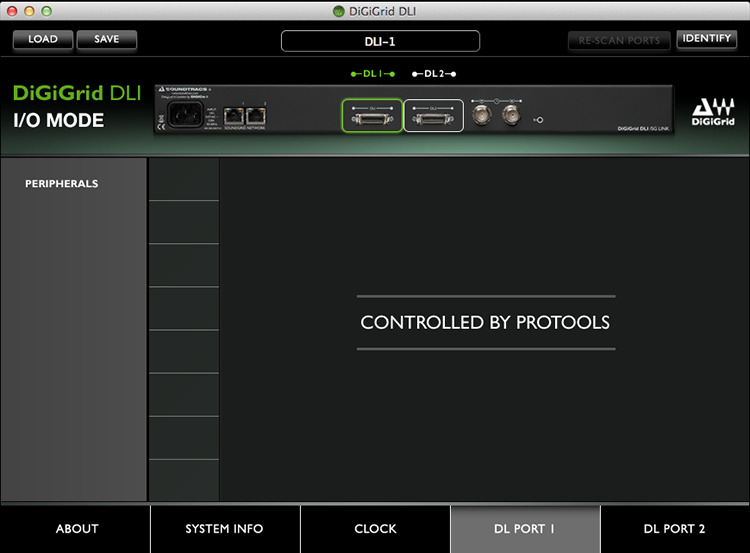 In I/O mode, the DLI bridges Pro Tools systems with SoundGrid I/Os and DSP servers. In this mode, the HD/HDX or HD Native system remains your playback engine, while the DLI appears as individual I/O units from which you can expand your studio by connecting additional SoundGrid I/Os and by offloading your plugin processing to additional SoundGrid servers. 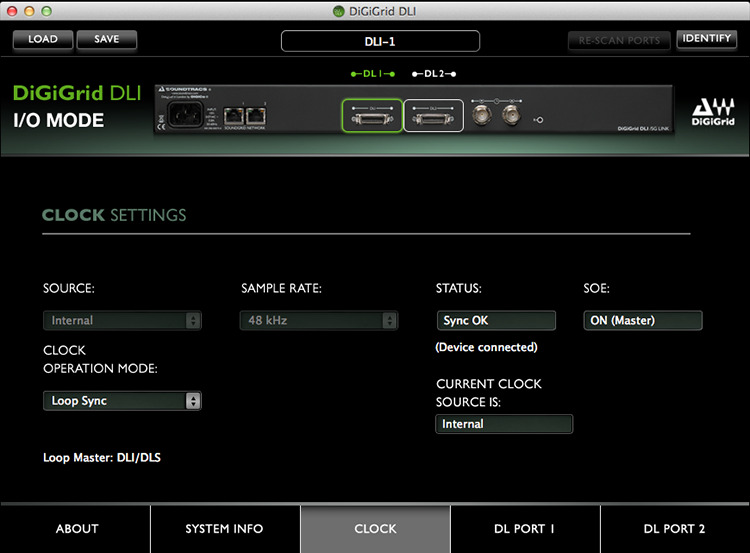 In SGP mode, the DLI enables you to control a variety of DigiLink-enabled I/Os, bridge your favorite DAW (Logic, Cubase, Nuendo, Ableton, Pro Tools Native, etc.) with SoundGrid applications and ASIO/Core Audio drivers, and offload your plugin processing to a SoundGrid server. Please note: Using any HD interface with Pro Tools 12.6 software requires a Pro Tools DigiLink I/O license. 2 DigiLink ports; 64 channels in either SGP or I/O mode (32 channels per port). Compatible with the following DigiLink-enabled I/Os: Digidesign 192, Digidesign 96 (Digidesign 96i not supported), Avid HD Omni, Avid HD I/O, Apogee Symphony Marks I and II, Lynx Aurora 8, Lynx Aurora 16 (32 channel mode on DL port 1 only). Your solution when you have a Pro Tools HDX system and want to take advantage of the extra power of a SoundGrid network. Adding a SoundGrid DSP server enables you to offload your audio processing, greatly increasing the number of plugins you can use simultaneously. Using the SoundGrid network for streaming audio signals from the DiGiGrid expansion I/Os (IOX) and their remote-controlled preamps into a Pro Tools HDX system. Positioning several DiGiGrid IOX expansion units in various spots in your live room (vocal booth, drum area, keyboard station, etc.) gives you a substantial amount of top-grade preamp inputs, as well as individual headphone outputs to each player no matter where he or she is standing. Each IOX unit is connected to a network switch in the live room, and an Ethernet cable connects the switch to a DiGiGrid DLI unit in the control room. This results in a large number of lines between the live room and the control room, all running through a single Ethernet cable. This configuration is part of a larger facility-wide network, so the control room’s Pro Tools system has access to I/Os throughout the building. This configuration adds efficiency to large multifaceted mixing environments. In this configuration, a SoundGrid network delivers flexibility to a control room equipped with a large Pro Tools HDX system. DiGiGrid DLI and DLS interfaces together provide 112 I/O channels to the HDX system, and the DLS provides a SoundGrid DSP server for plugin processing. An Avid Omni is the I/O for control room mixes. All these devices are joined via DigiLink and clocked with Sync Lock. Everything else in the network is connected with Ethernet cables. A DiGiGrid IOX supplies analog inputs with award-winning preamps, plus 4 separate headphone outs. This serves a voice-over booth, a broadcast stage, a live room, and more. A secondary DAW system can be a backup recorder, an editing room DAW, and a recording station for the voice-over booth. Its DiGiGrid IOC provides many channels of I/O, which can be allocated to the main DAW. A DiGiGrid MGB/MGO interface connects this network to a MADI source, for instance a console or a MADI distribution system. Audio can be routed to the main or secondary systems. You may have some older or unused Avid I/O devices. You can add these devices to a SoundGrid network in order to pick up extra I/O and A/D/A capacity. 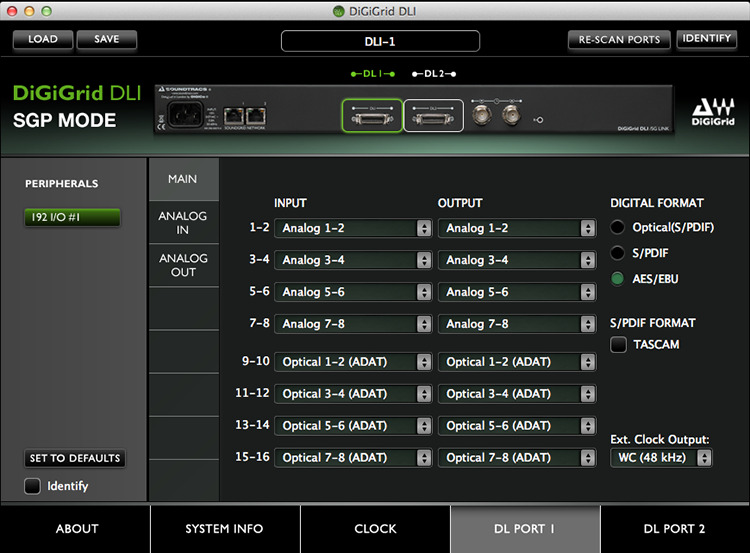 In this configuration, DiGiGrid DLI is the bridge connecting the Avid I/O unit to the SoundGrid network. Avid hardware is used for I/O and A/D/A conversion, but processing takes place on the host computer’s local CPU. This DiGiGrid DLI/Avid combination will appear on the SoundGrid Studio Inventory page as a DLI, which means that you can control the Avid hardware as you would any other SoundGrid device.